St. Gallen or traditionally St Gall, in German sometimes Sankt Gallen ( Sankt Gallen ; English: St Gall; French: Saint-Gall; Italian: San Gallo; Romansh: Son Gagl) is the capital of the canton of St. Gallen in Switzerland. It evolved from the hermitage of Saint Gall, founded in the 7th century. Today, it is a large urban agglomeration (with around 160,000 inhabitants) and represents the center of eastern Switzerland. Its economy consists mainly of the service sector. The official language of St. Gallen is (the Swiss variety of Standard) German, but the main spoken language is the local variant of the Alemannic Swiss German dialect. St. Gallen has an area, as of 2006, of 39.3 km2 (15.2 sq mi). Of this area, 31.1% is used for agricultural purposes, while 28.9% is forested. Of the rest of the land, 38.4% is settled (buildings or roads) and the remainder (1.7%) is non-productive (rivers or lakes). The founding of St. Gallen is attributed to the Irish monk Gallus (ca 550–620 or 640), who built a hermitage by the river Steinach in 612 AD. Around 720, one hundred years after Gallus's death, the Alemannian priest Othmar built a monastery and gave it the name monasterium sancti Gallonis (monastery of Saint Gall). In 719, its first abbot Otmar extended it to an abbey. In 926 Hungarian raiders attacked the abbey and surrounding town. Saint Wiborada, the first woman formally canonized by the Vatican, reportedly saw a vision of the impending attack and warned the monks and citizens to flee. While the monks and the abbey treasure escaped, Wiborada chose to stay behind and was killed by the raiders. Between 924 and 933 the Magyars threatened the abbey, and its books were removed for safekeeping to Reichenau. Not all the books were returned. In 1207, Abbot Ulrich von Sax was granted the rank of Imperial Prince (Reichsfürst) by Philip of Swabia, King of the Germans . As an ecclesiastical principality, the Abbey of St. Gallen was to constitute an important territorial state and a major regional power in Northern Switzerland. However, in 1803 it lost its independence and was incorporated into the new Canton of St. Gallen. 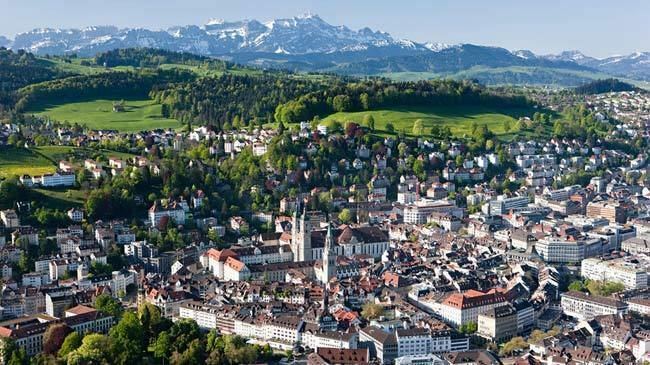 The city of St. Gallen proper progressively freed itself from the rule of the abbot, acquiring Imperial immediacy, and by the late 15th century was recognized as a Free imperial city. By about 1353 the guilds, headed by the cloth-weavers guild, had gained control of the civic government. In 1415 the city bought its liberty from the German king Sigismund. In 1405, the Appenzell estates of the abbot successfully rebelled and in 1411 they became allies of the Old Swiss Confederation. A few months later, the town of St. Gallen also became an ally. They joined the "everlasting alliance" as full members of the Confederation in 1454 and in 1457 became completely free from the abbot. However, in 1451 the abbey became an ally of Zurich, Lucerne, Schwyz, and Glarus who were all members of the Confederation. Initially, he protested to the abbot and the representatives of the four sponsoring Confederate cantons (Zurich, Lucerne, Schwyz, and Glarus) against the construction of the new abbey in Rorschach. Then on 28 July 1489 he had armed troops from St. Gallen and Appenzell destroy the buildings already under construction. Despite the unpropitious end of his career, Ulrich Varnbüler is immortalized in a famous by Albrecht Dürer, which is now part of the Smithsonian Institution's woodcut collection. In St. Gallen about 68.8% of the population (between age 25–64) have completed either non-mandatory upper secondary education or additional higher education (either university or a Fachhochschule). Out of the total population in St. Gallen, as of 2000, the highest education level completed by 15,035 people (20.7% of the population) was Primary, while 27,465 (37.8%) have completed their secondary education, 10,249 (14.1%) have attended a Tertiary school, and 2,910 (4.0%) are not in school. The remainder did not answer this question. St. Gallen has a population (as of 31 December 2016) of 75,481. As of 2011, about 28.7% of the population was made up of foreign nationals. Of the foreign population, (as of 2011), 5,118 are from Germany, 3,231 are from Serbia, 2,587 are from Italy, 1,093 are from Bosnia and Herzegovina, 952 are from Austria, 6,833 are from other countries. Over the last 5 years, the population has grown at 4.4% per year. Most of the population (as of 2000) speaks German (83.0%), with Italian being second most common (3.7%) and Serbo-Croatian being third (3.7%). Of the Swiss national languages (as of 2000), 60,297 speak German, 575 people speak French, 2,722 people speak Italian, and 147 people speak Romansh. The age distribution, as of 2000, in St. Gallen is: 6,742 (9.3%) between 0 and 9 years old; 7,595 (10.5%) between 10 and 19; 12,574 (17.3%) between 20 and 29; 11,735 (16.2%) between 30 and 39; 9,535 (13.1%) between 40 and 49; 8,432 (11.6%) between 50 and 59; 6,461 (8.9%) between 60 and 69; 5,633 (7.8%) between 70 and 79; 3,255 (4.5%) between 80 and 89; 655 (0.9%) between 90 and 99; 9 people (0.0%) aged 100 or more. In 2000 there were 16,166 people (22.3% who were living alone in private dwellings; 17,137 (or 23.6%) who were part of a couple (married or otherwise committed) without children, and 27,937 (or 38.5%) who were part of a couple with children. There were 4,533 (or 6.2%) people who lived in single parent home, while there are 419 persons who were adult children living with one or both parents, 475 persons who lived in a household made up of relatives, 2,296 who lived household made up of unrelated persons, and 3,663 who are either institutionalized or live in another type of collective housing. In the 2007 federal election the most popular party was the SP which received 25.4% of the vote. The next three most popular parties were the SVP (23.2%), the CVP (17.3%) and the FDP (15.3%). 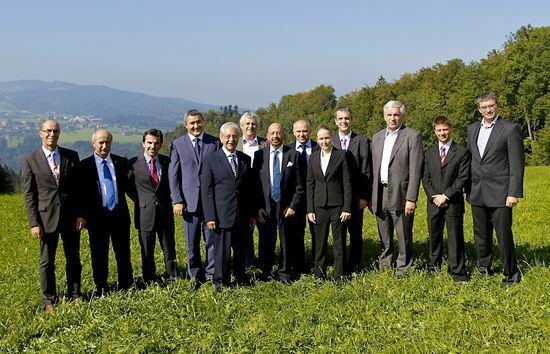 As of 2007, St. Gallen had an unemployment rate of 2.69%. As of 2005, there were 336 people employed in the primary economic sector and about 95 businesses involved in this sector. 11,227 people are employed in the secondary sector and there are 707 businesses in this sector. 48,729 people are employed in the tertiary sector, with 4,035 businesses in this sector. As of October 2009 the average unemployment rate was 4.5%. There were 4857 businesses in the municipality of which 689 were involved in the secondary sector of the economy while 4102 were involved in the third. As of 2000 there were 28,399 residents who worked in the municipality, while 8,927 residents worked outside St. Gallen and 31,543 people commuted into the municipality for work. According to the 2000 census, 31,978 or 44.0% are Roman Catholic, while 19,578 or 27.0% belonged to the Swiss Reformed Church. Of the rest of the population, there are 112 individuals (or about 0.15% of the population) who belong to the Christian Catholic faith, there are 3,253 individuals (or about 4.48% of the population) who belong to the Orthodox Church, and there are 1,502 individuals (or about 2.07% of the population) who belong to another Christian church. There are 133 individuals (or about 0.18% of the population) who are Jewish, and 4,856 (or about 6.69% of the population) who are Muslim. There are 837 individuals (or about 1.15% of the population) who belong to another church (not listed on the census), 7,221 (or about 9.94% of the population) belong to no church, are agnostic or atheist, and 3,156 individuals (or about 4.35% of the population) did not answer the question. In 1992 St. Gallen was awarded the Wakker Prize for the city's effort to create a unified structure and appearance in current and future construction. St. Gallen railway station is part of the national Swiss Federal Railways network and has InterCity connections to Zurich and the Zurich International Airport every half-hour. St. Gallen is the hub for many private railways such as the Südostbahn (SOB), connecting St. Gallen with Lucerne, the Appenzeller Bahnen with connections to Appenzell and the Trogenerbahn to Trogen, which also serves as a tram in downtown.